Due to the large amount of tree work that Nimrod undertakes, we have large stocks of dry, seasoned logs for sale. 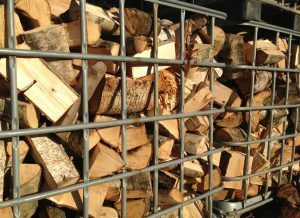 Our logs are kept dry from the elements, utilising cross cutting and effective stacking methods to reduce the moisture content of the wood making it suitable for use as fuel. Our logs are split and covered soon after felling and stored in a well-ventilated area under cover. We can deliver a wide range of amounts from bulk bags to tipper loads, depending on your needs. Call us on 01924 830961 to discuss your requirements, our friendly team will be happy to advise you/ quote you for delivery.